This recipe is closer to the original Korean formula, being made with Napa cabbage. Then we load three bushels of certified organic kale into each batch. 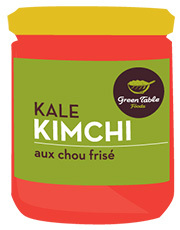 A little bit spicier than our original recipe Organic Kim-Chi. Barrel fermented, hand packed into glass mason jars. And always, made with 100% pure Himalayan pink salt.